Who are the Escape group? 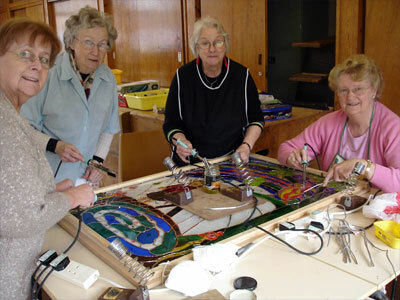 The Escape group is made up of 10 to 15 elderly women, all suffering isolation due to various reasons, including disability, old age or being a carer. They are supported by 2 workshop leaders who are stained glass artists, who teach the skills of stained glass to the group, 3 volunteer helpers who aid the running of the day, being an extra pair of legs, eyes and ears for the group and a voluntary transport scheme, run by the Eastwood Volunteer Bureau. The group takes place in Eastwood, 8 miles North East of Nottingham. The group has been running since 1992, whenever funding or commissions are available. It's fun to learn new things and produce beautiful objects, especially when you are elderly and can feel "on the scrap-heap"
"When I joined the group I couldn't even draw a straight line!"